A microhistory offers new insights into the creation of the Royal Society amid the intellectual brilliance of Restoration England. 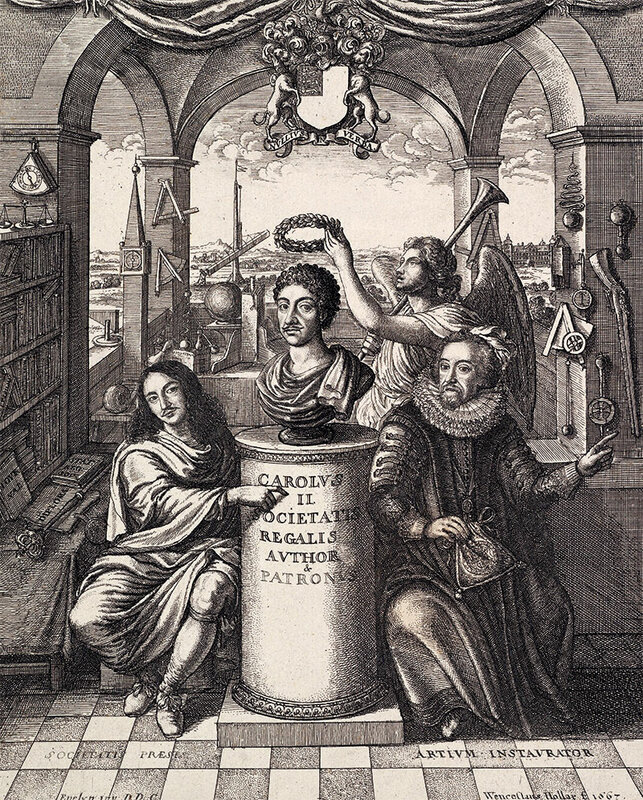 The frontispiece to Thomas Sprat’s History of the Royal Society, 1667. This book is devoted to a renowned image of 17th-century science, namely the frontispiece to Thomas Sprat’s book on the newly formed Royal Society. Founded in 1660, this was the first European learned society devoted to science. Its fellows included luminaries such as Robert Boyle, Robert Hooke, Isaac Newton and Christopher Wren. The frontispiece to Sprat’s book was designed by the diarist and virtuoso John Evelyn, himself a fellow, and etched by Wenceslaus Hollar, the prolific artist from Bohemia who settled in London. In the centre of the image a bust of Charles II, the society’s patron, is crowned with a laurel wreath by the goddess Fame. To the right sits Francis Bacon, the philosopher and Lord Chancellor, who at the beginning of the 17th century laid down a blueprint for the new science; to the left is the society’s first president, William, Viscount Brouckner. These figures are surmounted by the Royal Society’s coat of arms and set within an impressive interior of books and scientific equipment. Remarkably, this is the first in-depth analysis of the image, but surely it is the definitive treatment. It discusses how the frontispiece came into being; its overall design, the sources and their significance; the details of the books, portraits and institutional accoutrements of the Royal Society; the scientific instruments; and the publication and dissemination of the image itself. We learn about the context of the new science in its early years and the production and function of engraved frontispieces within this milieu. The text is succinct and engaging and is accompanied by 81 illustrations, which point to another of the book’s strengths: it shows historians how to incorporate visual evidence into their research. Early modern Europe was awash with printed texts and images, but until recently historians have generally been more at home with the former than the latter. This book shows that images can be probed in ways similar to texts, yielding just as rich a harvest. Hunter considers the precedent for the composition of the frontispiece, which results in a startling discovery: it resembles another earlier frontispiece, that of Nicholas Chaperon’s Sacrae Historiae. This is a homage to Raphael, whose bust occupies an equivalent place to that of Charles II in the Sprat frontispiece. The conclusion is that Evelyn wanted the new science to be as prestigious as Renaissance art. Turning to the books on the shelves in the Sprat image, there are tomes by Francis Bacon, Robert Boyle, Copernicus and William Harvey. Thus the society pays tribute to those who have provided much of its intellectual inspiration, while at the same time promoting the recent works of its members. Why was Evelyn so concerned to raise the prestige of the Royal Society and, by implication, the status of the new science? The answer is that at this juncture views on science included ambivalence and scepticism. While some were convinced that it had the potential to ameliorate life, others mocked the seemingly absurd experiments conducted by the Royal Society’s fellows – such as trying to weigh air or extract sun beams from cucumbers. It was not until Newton published Principia Mathematica in 1687 that the status of science was elevated permanently. In the preceding decade science was fighting to be taken seriously and Sprat’s frontispiece was part of this debate. Stephen Brogan is the author of The Royal Touch in Early Modern England (Royal Historical Society, 2015).